Recently, I have the opportunity to review the plugin and make some amendment to it. Please feel free to download and explore the source code. What's in the project solution? First, copy the PasswordPolicy.xml, PasswordPolicy.xslt and jquery.password-strength.js files into your application. Make sure both of the PasswordPolicy .xml and .xslt files are in the same location. The XSL is to transform the XML document into HTML. Let said both the files were being copied into the "XmlDoc" folder. Then, define a new key passwordPolicyXMLLocation under the application setting in the web.config file. Refer to figure 2. The PasswordStrengthIndicator.Core library will get the path to the XML file location based on the key. The password attributes rules in the PasswordPolicy.xml file can be customized to tailor your organization specification. The maxConsecutiveRepeatedChars is a new attributes in version 2.0. As mentioned earlier, this new attributes is to control the maximum number of consecutive repeating characters in a password. By default, the value is 0, no restriction on how frequent consecutive character repeating in a password. I would suggest setting the value to 1, that case it will also catch repeating string such as "T3chT3ch" or "NinjaNinja". 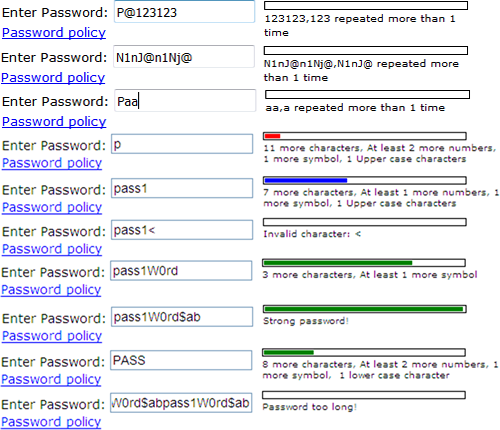 After that, add a reference to the PasswordStrengthIndicator.Core library to the web application/project. Next, add the plugin scripts into the web application. Depending on the project type, the way to referencing the plugin script (jquery.password-strength.js) could be vary. Shown in Listing 1 and Listing 2 are sample markup code from ASP.NET web and MVC applications. The blockUI plugin is optional, without it, the password policy popup will open on a new window instead of modal dialogs fashion. In the previous plugin (v1.0), user has to specify the exact XML file location in the .aspx page and inside the plugin script. In version 2.0, there is an option in the plugin to allow user to specify the path to the XML file. The syntax could be different depending on the application framework. The purpose of Page.ResolveUrl or Url.Content method in this context is to help find the root path to the web application. This is very useful moving from environment to environment. For instance, let said the virtual path in the local development environment was set to "/" and the XML and XSLT files are both under the root application. In the .aspx page, we specify appFolderXMLPath: "/". In this scenario the plugin will look for the PasswordPolicy.xml file under the application root and everything will work out fine. What if application virtual path is set to "/MyApp_Dev" on the development server? The plugin will not work in this setting because it can't find the xml file under "/". It will be troublesome if we hardcoded the path and then has to modify it for each environment. There also an option in the plugin to allow user to specify the password policy link id. This is where the new window appears and displaying the XML file content in HTML format when user clicks on the anchor link. Previously the anchor click event was on the .aspx page and now the hookup is inside the plugin script. Shown in listing 3 is an example on how to call the helper method to validate the password strength on the server side. Shown in listing 4 is the regular expression generated by the plugin based on the setting in the PasswordPolicy.xml file to validate the password. You can test it out on regexlib.com; make sure to uncheck the Case Insensitive checkbox. If the result displayed as "No Results", that mean the password does not satisfy the regular expression. Shown in table 1 is the breakdown of the regular expression in listing 4 and a brief description. I hope someone will find this information useful and make your programming job easier. If you find any bugs or disagree with the contents or want to help improve this article, please drop me a line and I'll work with you to correct it. I would suggest downloading the demo and explore it in order to grasp the full concept because I might miss some important information in this article. Please send me an email if you want to help improve this article.